State Boards of Nursing (BON) are committees established by law to regulate the practice of nursing. The purpose of the BON is to protect the health of the public by ensuring safe nursing practices within its jurisdiction. (a) To protect consumers by providing evidence that the nurse meets all requirements to practice safely. (b) To provide uniformity in development of standardized procedures. Chapter 464.002 Purpose.—The sole legislative purpose in enacting this part is to ensure that every nurse practicing in this state meets minimum requirements for safe practice. It is the legislative intent that nurses who fall below minimum competency or who otherwise present a danger to the public shall be prohibited from practicing in this state. 464.006 Rulemaking authority.—The board has authority to adopt rules pursuant to ss. 120.536(1) and 120.54 to implement the provisions of this part conferring duties upon it. The Louisiana State Board of Nursing is a legally created	administrative	agency	acting	within	the governmental structure of the state and possessing legal power. To safeguard life and health of the citizens of Louisiana, the law governing the practice of registered nursing, as re-enacted and amended, delegates to this board the responsibility to establish and publish standards of nursing practice; to regulate the practice of nursing by the registered nurse and the advanced practice registered nurse; to provide for examination and licensure of the nurse practicing as a registered nurse and an advanced practice registered nurse; and to establish standards for educational programs preparing individuals for nursing practice. TITLE 22, PART 11, CHAPTER 211, Rule §211.2 "The purpose of the board is to protect and promote the welfare of the people of Texas. This purpose supersedes the interest of any individual, the nursing profession, or any special interest group." accredit or approve pre-licensing education programs that prepare individuals to become licensed/registered or advanced practice nurses. The duty of your BON is to protect the public by ensuring the safe practice of nursing. It is within the purview of the state board of nursing to discipline individuals for violations of the NPA. It is also within their purview to ensure the right of the nurse to perform all of the lawful activities described in the nursing practice act.• It is not lawful for any entity, e.g., physician, organization or institution, to abridge or expand the boundaries of nursing practice without approval from the BON. Physicians and hospital may authorize significant changes in nursing practice as long as they inform the state board of nursing in that state. State boards of nursing also regulate continued competency requirements for licensure renewal. To date 33 states require some type of continuing education for RNs and LPNs usually during a two-year period. The number of contact hours and the type of requirements vary from state to state. The number of contact hours range from 15 to 30 every two years. Usually these are obtained through continuing education courses offered by approved providers. Some states waive contact hours requirements if the nurse is engaged in nursing practice. Some states give credit for nursing presentations, published nursing articles, and research studies. Some states have specific requirements for the type of courses that must be taken. For example, nurses licensed in Florida are required to complete contact hours encompassing the topics of: Medical Error Prevention, and those Florida nurses renewing in 2015 and thereafter are required to complete an approved course on the Florida laws and rules governing nursing practice. All states require nurses to acquire 30 contact hours of continuing education every two years. Licensing of nurses was the goal of our second nurse organization, the Nurses' Associated Alumnae of the United States and Canada. They were founded in 1896 and are known today as the American Nurses Association (ANA). The ANA is America's largest and most influential nursing organization. It seeks to advance the nursing profession by "fostering high standards of nursing practice, promoting the rights of nurses in the workplace, projecting a positive and realistic view of nursing, and by lobbying the Congress and regulatory agencies on health care issues affecting nurses and the public." The ANA represents nurses at the state level through its Constituent and State Nursing Associations. In 1978, the American Nurses Association (ANA) Council on State Boards of Nursing recognized that their mission would be better served by forming a national independent organization focused on providing regulatory excellence for public health, safety and welfare. The National Council on State Boards of Nursing (NCSBN) was formed. "NCSBN is devoted to developing a psychometrically sound and legally defensible nurse licensure examination consistent with current nursing practice. NCSBN became the first organization to implement computerized adaptive testing (CAT) for nationwide licensure exams in 1994. In addition to the NCLEX-RN and NCLEX-PN examinations, NCSBN also develops and administers the largest competency evaluation for nurse aides known as the National Nurse Aide Assessment Program (NNAAP). "• Finally, the NCSBN manages the Nursys database which contains national information on nurse licensure that is publically available. If a nurse applies for a license in a different state, if their former state is connected with the Nursys database, the nurse’s license activity can be obtained quickly. Nursing organizations differ from state BONs in several ways. First, while a BON's only duty is the safety of patients served by nurses within its jurisdiction, a nursing organization's duty is to advance the interests of its membership and the public. Second, nursing organizations serve the profession and society by advancing the philosophy and practice of nursing. They guide the integration of philosophy and new practices within today's dynamic health care environment. Professional nursing organizations often develop the benchmarks used by the individual nurse and regulators to assess and improve the quality of patient care. Nursing organizations provide the evidence necessary to support expansion of the scope of nursing. Third, only a BON determines the scope of nurse practice, only their policy and position statements carry the weight of law. The differences between the duties of a BON and those of a nursing organization sometimes result in conflicting positions regarding the practice of nursing. The NCSBN is a LPGP grantee. "The NCSBN has developed a far reaching mutual recognition model for licensing nurses. Under this mutual recognition model, practice across state lines is allowed, whether physical or electronic, unless the nurse is under discipline or a monitoring agreement that restricts practice across state lines. 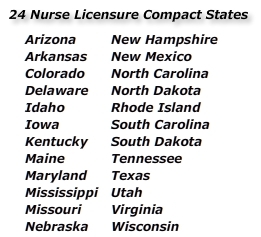 In order to achieve mutual recognition, each state must enter into an interstate compact, called the Nurse Licensure Compact (NLC). The NLC was first implemented on January 1, 2000, when it was passed into law by the first participating states: Maryland, Texas, Utah and Wisconsin. Currently, 24 states participate in the NLC."